It comes as no surprise that most questions that users have are about activating free copies of Windows 10. Microsoft distinguishes between digital entitlement and product key activation methods in Windows 10. All free Windows 10 upgrade versions, versions of Windows 10 bought from the Windows Store, and Windows Insider versions use the digital entitlement activation method. Copies of Windows 10 bought from authorized retailers (either digital or physical), that are pre-installed on OEM machines, or provided through volume licensing agreements or MSDN use product keys as the activation method. Digital entitlement does not require a product key. The activation is linked to the device. 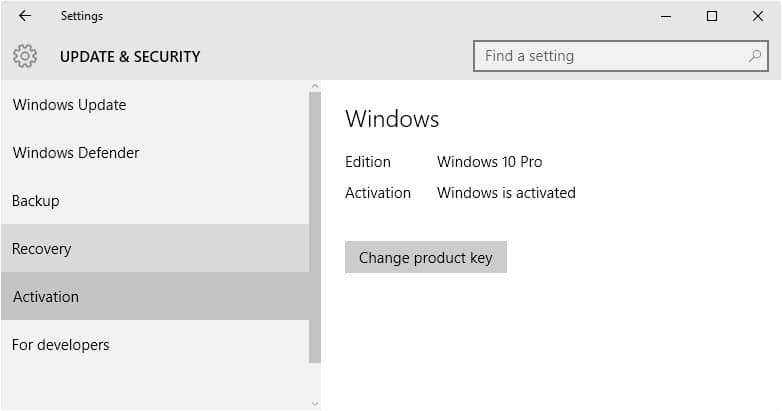 Since activation is linked to the device, it is possible to re-install the same version of Windows 10 on the device without entering a product key and have it activated once the installation completes (by skipping the product key step). Obviously, you need to make sure that Windows 10 has been activated once on the device before you reinstall the operating system on it as you won't be able to do so if it is not fully activated (and thus linked to the device). The main issue with this type of activation is that you cannot use this activated version of Windows 10 on a new device. If you have been running Insider Builds before Windows 10 was officially released by Microsoft, your system will remain activated for as long as you don't revert back to regular builds of Windows. New users who opt-in to the Insider program need to activate Windows 10 before they can activate the system. Installing Windows 10 Insider Preview on a device that never had an activated copy of Windows 10 on it will require using a Windows 10 product key or buying genuine Windows from the Windows Store. This also applies if the new installation is for an edition of Windows 10 that wasn’t previously activated on the device. More information and instructions about Windows 10 activation errors here. You ran a clean install of Windows instead of upgrading from previous versions of Windows. The fix for this is to go back to the previous version, and run the upgrade from it to get Windows 10 activated properly. The activation servers may have been busy. Windows will try again or you can try and activate manually under Activation in the Settings. An invalid product key was used, for instance a Windows 7 product key. This error is thrown if third-party software added display languages to Windows that are not officially supported. To fix it use system restore, restore backups or reset the PC. This happens when you try to use an upgrade key on a fresh installation of Windows 10 without previous versions of Windows present on the device. If you receive this error, something is blocking Windows 10 from completing the activation process online. Either try to troubleshoot the issue so that the activation can be performed online, or use the phone activation method instead. The product key is not accepted because its number of activations has been exceeded. This can be the case if Windows 10 has already been installed on another device and activated using this product key. Solution is to buy another product key, or to contact Microsoft Support to sort out the error if it is one. This error is similar to the one above. It means that the activation limit for the entered product key has been exceeded. This refers to network issues while trying to activate a work PC. These errors may be thrown if you are trying to activate a work PC while not connected to the work network. The error may be thrown if third-party software, corruption or attacks modified system files needed for Windows activation. System Restore, backups, or a reset, may resolve the issue. This error may be thrown if the system's date and time are set incorrectly, or if Windows cannot connect to the online activation service. Microsoft recommends to activate Windwos manually if the error is displayed. This is done with a click on Start, and the selection of Settings > Update & Security > Activation > Activate Windows. Microsoft has released the official Windows 10 activation guide and troubleshooting tips for activation issues. That only applies to people who were not in the insider program before Windows 10 was released and who also, for whatever reason, don’t have a license for Windows 7 or 8 they could upgrade. What you find hilarious is a situation that is not actually the case. It’s also worth noting that the “device” your license is tied to is the motherboard, though they make it a little vague by saying “significant hardware changes to your device, such as replacing the motherboard”. If you build your own desktop PC and plan to get a new motherboard, either upgrade the hardware before you upgrade the OS or make sure you keep your Windows 7/8 installation media and license key so you can install and then upgrade to Windows 10. The good news is that you don’t have to worry about replacing your system hard drive – you should be able to do a clean install of Windows 10 on a new hard drive, as long as you don’t also replace the motherboard. The reason I didn’t do the free upgrade to Windows 10 yet is because I’m scare of what will happen when my motherboard finally fails (it’s having hiccups posting sometimes). Personally I would upgrade your hardware first before doing the Windows 10 Upgrade. Since it’s tied with your machine, you’ll have a bit harder time with the activation’s process and will need to call Microsoft to get it cleared up. Tho, they might give you a key that you can input every time, which would make it easier. Alternatively, you could go out and purchase a key and not have to worry about it. I love their solution to Activating Windows 10 after a hardware configuration change. If you upgraded to Windows 10 using the free upgrade offer and then made significant hardware changes to your device, such as replacing the motherboard, Windows 10 might no longer be activated. For help on how to activate your device, contact customer support. So much for Microsoft saying that you will get a like for like licence, when upgrading from a retail copy of previous Windows. I upgraded from a fully licensed retail copy of Windows 8.1, which I can freely move to another computer and activate as many times as i want, but Windows 10 is now technically oem and tied to my hardware! Makes me want to revert back, I will have to anyways after the “free” offer expires….